Raindrops are falling on your head, and you’re in your house. It’s time for a new roof. There are just so many roofing companies out there vying for your business. You wonder what to expect from a professional roofing company that will do the work you want, at a price you agree to, and not leave you standing in the rain? …It’s all about doing your homework. Probably the best way to pick a reputable roofing company is by word of mouth. Do you know anyone who has recently had roof repairs or a roof replacement done? Ask them what their experience was? Were they happy with the results? Did the workers show up on time? Did the roofing company stay within the agreed upon budget? And did they clean up the work area when done? Someone who is pleased with the service and end result will be happy to tell you. And if they were dissatisfied with their experience, they will be happy to share that with you as well. What if you don’t know anyone who can refer you to a reputable roofing company? Check the names of the roofing companies in your area with the Better Business Bureau for any customer complaints. Ask your local building officials if the company has a history of following all local laws and ordinances. And don’t be bashful about asking the company for the names and phone numbers of customers they’ve done work for in the past. A reputable company will be glad to supply you with this information. Call these previous customers for references. Many roofing companies will put a sign in the yard of a home they are working on. Stop by and ask questions. Is the company using quality materials? Okay, you have selected a roofing company you feel will do a great job for you. Do you know how long they’ve been in business? Are the workers experienced, or is the work contracted out to others? Will the company stand behind its work if there is a problem? Your questions should be welcomed and answered without hesitation. Also ensure the roofing company is insured and bonded. You should always feel comfortable with your choice of roofer. 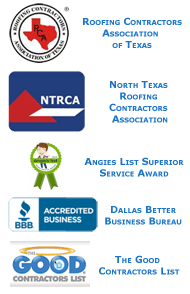 The knowledgeable folks at Texas Star Roofing pride themselves on their customer service. You are always our top priority. Once you talk with our experts, you will know you and your roof are in good hands. Whenever a homeowner calls a repairman out to their home, they have certain expectations. They may expect to pay a certain amount. They may expect the repairman to get to the home within a specific time frame. And they probably expect the repairman to do their job and fix any problem properly. Some of homeowner expectations are reasonable, some aren’t. 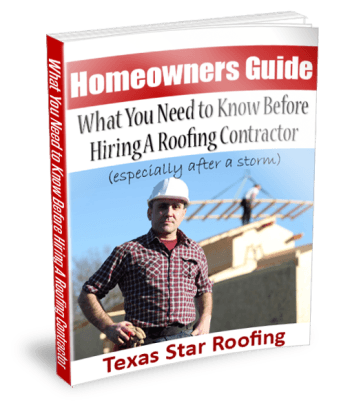 When it comes to hiring a roofing professional like Texas Star, here’s exactly what you should expect. Whether a person is hiring a professional for a repair or a replacement of the entire roof, they should expect an estimate. To give a good, detailed estimate, the roofing professional should do a thorough inspection of the roof and the roofing structure. This will usually include looking at the roof from the outside and the inside of the home. The inspection should be provided to the homeowner in written form, with locations of damage and how to go about performing repairs/replacement. The estimate should include the total cost of the job, and a breakdown of the materials and the labor for the job. One of the most important things it should include is a date when the roofer can start the work and when it will be completed by. All of this needs to be in writing. The cost of the estimate will vary, but is often done for free. These are reasonable expectations. Ultimately, homeowners need to understand that this is an estimate. Specialists may uncover problems as they remove parts of the old roof that could not be anticipated. It is possible that a job will cost more or less than the estimate. It may take longer to complete. A homeowner that thinks an estimate is the final bill is not being reasonable. A professional roofer should tell the homeowner when they will do the job. They should be there at the time they promise. They should have all of the supplies they need to do the job, and they should have the manpower they need to complete the job. The professional should also have insurance to cover any accidents that occur on the job. They should finish the job in a timely fashion, and they should clean up after themselves. These are reasonable expectations. A homeowner should realize that roofing can be dangerous work. Bad weather can put a roofer behind schedule. 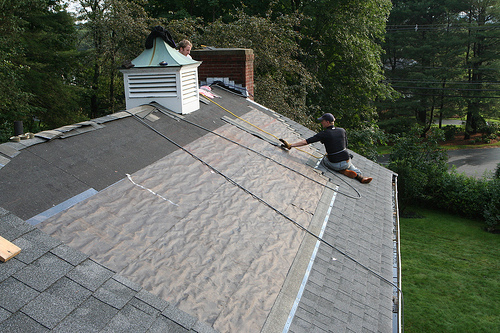 It can also mean the company is busier and has many people in need of roofing services. While every homeowner thinks she is the most important customer, a roofing professional is trying to help all customers. It is not reasonable to expect roofers to work in dangerous conditions, and a homeowner may have to be patient at times. Professional roofers should stand behind their work. If the roof is still having problems, the roofer should be willing to fix it in a timely fashion. The materials in roofing often carry long guarantees, but that is only as good as the roofer behind them. Homeowners should expect the roofer to fix their roofs the right way. Understanding what is reasonable to expect and what is not reasonable is a good way to make both the homeowner and the roofing professional happy. The roof of a home is designed to last a long time. Most homeowners only have to worry about owning a home long enough to replace a roof one time. Most homeowners do not have a roofing company that they can call on because they need it so infrequently. A homeowner is also not likely to be an expert on what a roof is supposed to look like or how to tell when there is a problem with the roof. Since homeowners are not experts on roofing, they need to make sure that they call one in if they are having problems with their roof, or if they are buying a new home and want to know the condition of the roof. A roofing contractor can provide this information to the homeowner through a roofing inspection. A homeowner may not completely understand how their roof works, but they need to know what to look from a reputable roofing company. Timeliness – The homeowner should not have to wait a long time for a contractor to come out and inspect the roof. If they are having problems with a leak in their home, they cannot afford to wait for the contractor to get to their home. A good contractor will be able to schedule a roofing inspection quickly. Equipment – The contractor should have the equipment they need to inspect the roof and to do it safely. Thoroughness – A good roofing inspection needs to be thorough. There may be some roofs that are in such bad shape, that it is obvious they need to be replaced just by looking at them from the ground. Even in these cases, a more thorough inspection is needed. The extent of damage that a roof has cannot be seen from the ground. There is no way to tell what the material under the roof tiles look like unless the contractor gets up on the roof and checks it out closely. The contractor needs to inspect the entire roof so they can understand any of the special challenges that might be involved in repairing or replacing a specific roof. These can include things such as chimneys, skylights and all of the different peaks and valleys of the roof. Estimates & Report – There are some roofers that will give an estimate of the work that is needed on the spot. Most roofing contractors will take the time to provide a more detailed report and a more accurate estimate. This report should be made available to the homeowner in a timely fashion. Roof inspections are a very important thing for homeowners to know about. A new roof on a home can be very expensive. Before a person makes a decision about her roof, she should know what is needed and available options. Repair or replace is only part of the decision-making process. The type of roofing material and what that will mean are also important to think about. Most reputable roofing contractors arrive on time and are courteous. Customer service is a part of their business. They will not only do a quality job on your roof installation; they will also do their best to leave your home and yard the way they found it. That being said, there are a few things that you, as a homeowner, can do to make sure everything runs smoothly before the work crew even arrives. Make sure to safeguard both the inside and outside of your home. While the crew is working on the roof, debris may be loosened underneath. Make sure that there aren’t any exposed valuables in your attic that could be damaged by this falling debris. Walls can be affected by vibrations as well, so make sure that paintings and photographs are secure. It’s a good idea to take the additional step of securing any breakable items on shelving that is attached or close to walls. Additionally, on the outside of your home, make sure that cars, bicycles, patio furniture, grills, or children’s toys are kept far enough away from the house so as not to be damaged by falling shingles. Children and pets should be kept inside during construction times as well. Skylights will need to be removed during the roofing process, so make sure anything located underneath them is moved out of the way. Be sure to turn off any alarm systems that can be triggered by the removal of the skylight. Most roofing contractors will replace TV antennas and satellite dishes after they’ve removed them, but it’s a good idea to discuss that first, as they may not accept responsibility for any damage caused to the items during the roof installation. If you will not be home when the work crew arrives, be sure that any gates are left unlocked, so they can gain access to the area around the home. Automatic sprinkler systems should also be disengaged for obvious reasons. In areas that have a lot of storms, you’ll find a lot of scammers. These folks follow the storms so that they can fleece homeowners by doing worthless repairs to roofs. If someone knocks on your door and offers you a deal that is far cheaper than you would expect it to be, they’re probably a con artist who’s trying to rip you off. Don’t give in to the low price they offer. Remember, you get what you pay for in life, and a deal that’s too good to be true usually is. These con artists are easy to spot. They come to you, first of all; a legitimate roofing company will never do that. Fakes require a cash payment before they do the work, usually because they need to get materials for the job— or so they say. They do not offer contracts. They also will not provide you with any local references. Check their truck’s license plate. It’s probably from out of state. Ask for their phone number. It will most likely be from out of state too. They will also not be able to provide proof of insurance. The best way to protect yourself from rip-off roof repairmen is to always use a reputable roofer that your neighbors, friends or relatives can recommend. Don’t let a low price entice you into hiring a scammer to do your work. Check your homeowner’s insurance to see exactly what is covered. Before your roof gets damaged, call the professional roofers at Texas Star. We’ll come out and examine your roof to make sure it will withstand a storm. If it does get damaged, let us know, and we’ll fix it properly and quickly. Your home is your biggest asset… Don’t let a con man rip you off! Know exactly what to expect from professional contractors by calling Texas Star Roofing today.